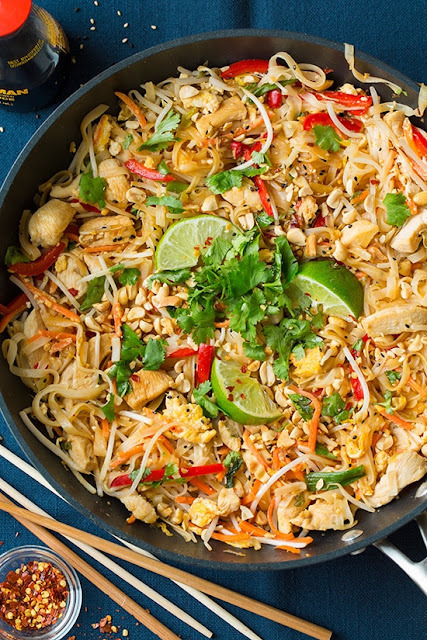 Isn’t it about time we stopped relying on take out to get Chicken Pad Thai and making it at home instead? This veggie and chicken version will leave you wanting to make it at home time and time again! Prepare rice noodles according to directions listed on package. In a mixing bowl, whisk together brown sugar, soy sauce, rice vinegar, lime juice and fish sauce, set aside. While noodles are cooking, heat oil in a wok or large and deep non-stick skillet over medium-high heat. Once hot add chicken and saute until cooked through, about 4 - 6 minutes. Transfer to a plate, leaving oil in pan. Add bell pepper and carrots and saute 1 - 2 minutes then add garlic, green onions and bean sprouts saute 1 minute longer. Push veggies to edges of pan and crack eggs into center. Cook and scramble until eggs have cooked through. Add in chicken, noodles and sauce and toss everything together and cook 1 - 2 minutes. Serve warm topped with cilantro, peanuts and optional red pepper flakes and sesame seeds. 0 Response to "Chicken Pad Thai"